Shaped like letters, these eye-catching artworks are made from recycled aluminum cans. Creativity, patience, and a hole punch: That's all artists Hannah Dreiss and Nemo need to turn other folks' trash into treasure. Together, they collect cast-off cans, transforming them into sculptural artworks that dance with the slightest stirring of air. Shaped like letters, these beauties are a fun way to add recycled flair to your decor. Use them to represent your family name, or spell out a special word, like "home." Playful, interactive, and slightly sparkly, they'll stand out in any room. Handmade in Texas. Want to learn more about Hannah and Nemo—and how they make garbage look so good? Be sure to visit our blog. 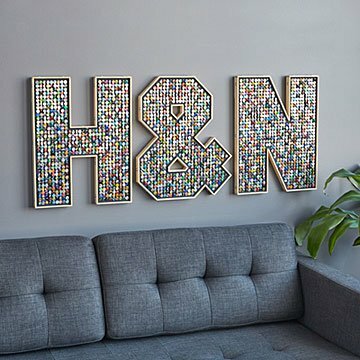 Hannah Dreiss and Nemo create unique mosaics out of common materials. Their flickering tapestries feature recycled objects like aluminum cans, a reflection of the resourceful way they choose to live: trekking from art festival to art festival in their home on wheels. The eco-folk artists both have backgrounds in architectural design, which you can see in the colors, patterns, textures, and movement of their work—a commentary on the fleeting beauty of the everyday. This art piece is designed for interior display. Dust with a dry wide paintbrush in downward strokes. This is a made-to-order item. If you order today your item will ship no later than 6/3/2019.